- Size Range: 8"/200mm, 10"/250mm, 12"/300mm, 14"/350mm, 18"/450mm, 24"/600mm, 36"/900mm. 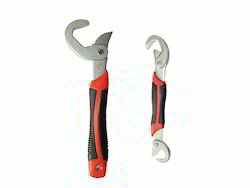 Drop Forged, Pipe Wrench Stillson type, duly hardened & tempered. Backed by a team of well qualified and experienced professionals, we are engaged in offering a wide array of Pneumatic Socket accessories to our respected customers. Reckoned amid one of the credible market names, we are engaged in offering to our patrons Torque Wrench. We are involved in presenting a world class series of Lenox Pipe Wrenches. It is available with us in diverse structures that meet on client’s demand. - 16 Pcs 19mm series metric 12 point socket (21mm, 22mm, 23mm, 24mm, 26mm, 27mm, 28mm, 29mm, 30mm, 31mm, 32mm, 34mm, 36mm, 38mm, 41mm, 46mm). - 4 Pcs 25mm series metric 6 point two color socket. - 1 Pc 19mm series heavy duty sliding bar 18". - 1 Pc 19mm series heavy duty extension bar 18". - 1 Pc 19mm series heavy duty short bar 8".